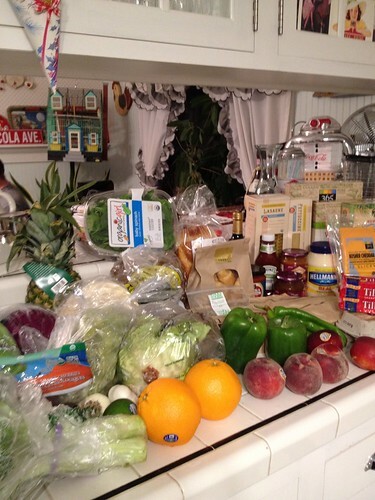 Yesterday Lisa and I did our monthly grocery shopping trip. Neither of us needed to be home by any particular time so we decided to go ahead and go on up to Oklahoma City so we could go to Whole Foods. We stopped in Norman first for a nice lunch at Tres Cantina with two friends, then went to Homeland and Dodson’s. Despite a lengthy lunch we still made it to Whole Foods with plenty of time to spend a lot of money there. 😉 Afterwards we browsed awhile in a really cute shop. We both saw lots of things we liked but everything was really, really expensive. For instance, I saw a darling leather purse with fringe but it was over $450. Um, no. We then tried a new-to-us restaurant for dinner, Tucker’s. Oh, my goodness. They have delicious hamburgers and even better, the beef comes from a ranch in Kansas, is humanely raised and never given hormones or antibiotics. The buns are made fresh every day at an OKC bakery and just might be the best part of the burger. You can bet we’ll be going there again. I didn’t do a video this time because Chris was over here working on his upcoming DJ set at our kitchen table but I did take some pictures. If you click on them you’ll be taken to Flickr where I’ve labeled the items in case you are that nosy curious. 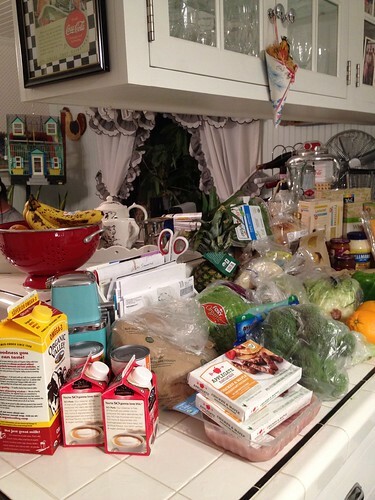 If you post grocery hauls or have any favorites you’d like to share (blogs and/or YouTube videos) leave me a comment. For some reason I just love to see other people’s groceries. Ha! 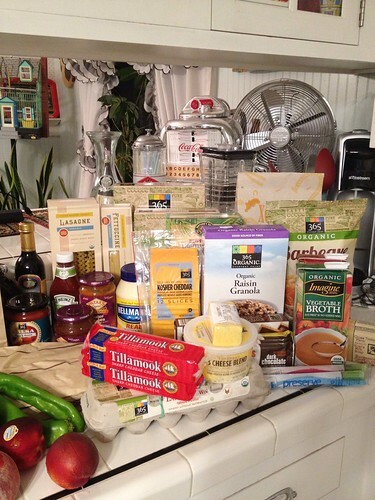 *Lisa’s grocery haul post can be seen here. Just curious. How do you keep cold things cold for that length of time? Coolers and ice or ? I have really good insulated bags and I put ice in along with the food. Even the frozen things stay frozen. Pretty peaches! They look as good as my Georgia peaches (sadly the last of the crop this year, boo hoo). We have two insulated bags and a rolling Igloo cooler that we put ice in too when we do grocery trips. When we go to Florida we pack frozen and cold items in the insulated bags and 9 times out of 10 the frozen stuff doesn't thaw out AT ALL in that 7 hour drive. I've learned to pack a semi-frozen item if it's planned for that night's supper. Terri, we live near "the peach capitol of Oklahoma" and I only got enough to put up two batches for ice cream in the freezer this year. I was in California twice during our peach season and just didn't have time for more. I did, however, enjoy a LOT of peaches from my aunt's tree in California.